We’d love your help. Let us know what’s wrong with this preview of Kneeknock Rise by Natalie Babbitt. From the moment young Egan arrives in Instep, he senses the spell cast over the villagers by the Megrimum--the mysterious something that lurks on the mist-wreathed peak of Kneeknock Rise. Everyone shudders in horror--delicious horror--whenever the Megrimum's unearthly wail floats down to the village. Before long, Egan is climbing the Rise to find a practical explanation for those wails. To ask other readers questions about Kneeknock Rise, please sign up. I read this book a long time ago then lost it (cant believe I did that) who liked it? Louie I liked it. Natalie Babbitt is such a good author. Another on the possible read-aloud list that probably won't make the cut for various reasons. 1) I LOVE the name of the mountain, which is the name of the book, it is pretty creative. Local people are frightened of it, so they call it "Knee-knock Rise." The small town at the base is called, also creatively, Instep. 2)I'm just not sure what Babbitt was getting at here. As much as I really don't like to put words into someone else's mouth, I feel there could be several interpretations, which I wil Another on the possible read-aloud list that probably won't make the cut for various reasons. 2)I'm just not sure what Babbitt was getting at here. As much as I really don't like to put words into someone else's mouth, I feel there could be several interpretations, which I will share with you. The book explores the timeless theme of belief...and why people believe. I could very possibly be over thinking this, but here are a few ways one might consider the purport of this book. a) People who believe in God are fools, but they're mostly happy fools. He's not really there, but it gives them pleasure and purpose to believe He is. Conversely, the wise do not believe in Him, but maybe they're not so happy? Religion is the fool's opiate? b) People are super gullible. Their need for something to believe in is so important that they will not believe anyone who tries to "cure" them of their wrong beliefs. It suits some people's purpose to believe the universe revolves around our planet. c) People as a mass blindly follow tradition/custom. If it's been done forever, it should keep on being done forever. Even if at least some of them "find out" that there's no meaning in the said tradition/custom, they should keep their mouths shut, nobody cares. For the sake of the economy, or the national morale, or whatever, just keep on doing what's been done. Status quo. I don't particularly like any of those interpretations. In all of them, the message is that "people" are pretty stupid. All in all, there was some nice imagery, some nice writing, but it left me feeling unsatisfied. Of course a "believer" who thinks he has, in a sense, unmasked the wizard and found only a grumpy, little man, would naturally feel unsatisfied if they had been a sincere adherent up until that point. I can imagine the confusion and even possible consternation. Who had a certain fool. From forty years of schol. And sang them just the same. The fool was gay. The king was not. And which the wiser man? I apparently adore everything Natalie Babbitt wrote. Read this aloud to Fox at age 8 and we both loved it. Such good books for kids, with a lyrical quality and depth that adults will also fall in love with. I love how Natalie Babbitt does not overuse words. She knows exactly what words to use to paint a realistic image in your mind and to tell a fantastic story. This story is simple and to the point, it does not drag on unnecessarily. I can see children as well as adults enjoying this story. I highly recommend this book. I thought I was going to love this book. Halfway through, I was sure I was going to love it. It ended up leaving me with a lot of thoughts, but mixed feelings. The fact that this brief children's book left me thinking quite deeply is a sign of how good the book was, but still. I think I wanted something different out of it in the end. One of the blurbs on the back of the book describes it as a "new folktale," and that's probably an apt description. The story tells the tale of a boy named Egan as I thought I was going to love this book. Halfway through, I was sure I was going to love it. It ended up leaving me with a lot of thoughts, but mixed feelings. The fact that this brief children's book left me thinking quite deeply is a sign of how good the book was, but still. I think I wanted something different out of it in the end. One of the blurbs on the back of the book describes it as a "new folktale," and that's probably an apt description. The story tells the tale of a boy named Egan as he visits the town of Instep. Instep is situated at the base of Kneeknock Rise--a mountain that is continually shrouded in mist, home to the Megrimum, a fearsome creature that moans frightfully during rainstorms. The town's inhabitants have all kinds of superstitions about how to protect themselves from the Megrimum, and as Kneeknock Rise is the most exciting thing for miles around, there's a certain level of pride mixed in with their fear of the beast on the mountain. Kneeknock Rise acts as somewhat of a tourist attraction each year when Instep puts on a fair and travelers arrive hoping to hear the Megrimum. The reader is introduced to the monster and the legends surrounding it through the eyes of an outsider, as Egan tries to figure out exactly what it is that lurks at the top of Kneeknock Rise. The book ultimately explores the nature of mystery and belief. Why do we believe? Is it because we need to believe in something, regardless of logic and fact and reason? Or is there something more to it than that? "It's the knowing there's something different, something special up there waiting. It's the knowing you could choose to change your days--climb up there and throw yourself right down the throat of the only and last and greatest terrible secret in the world. Except you don't climb up." Very fast read, obviously, because it's a 120 page childrens book. I needed a break from the heavy-handed sci-fi that I was reading. I picked this up because I loved "Tuck Everlasting" and this was by the same author. I don't know about anyone else, but this book felt like a God allegory. A small village has a local legend of a mythical beast that lives at the top of a cliff on their mountain, which howls loudly during heavy rain/lighting storms. Everyone is scared of it (but also kind of fond o Very fast read, obviously, because it's a 120 page childrens book. I needed a break from the heavy-handed sci-fi that I was reading. I picked this up because I loved "Tuck Everlasting" and this was by the same author. I don't know about anyone else, but this book felt like a God allegory. A small village has a local legend of a mythical beast that lives at the top of a cliff on their mountain, which howls loudly during heavy rain/lighting storms. Everyone is scared of it (but also kind of fond of it), yet it also makes the village famous, as people from miles around to hear the beast howl. And, of course, no one wants to climb to the top of the mountain to actually SEE if there is a monster. They just KNOW it's there. Enter our protagonist, a young boy who (duh) climbs the cliff during a storm, and discovers a scientific explanation for the howling sound. He comes back down, and tries to tell that villagers that the beast isn't real...and they refuse to hear. They refuse to listen to the scientific explanation for the beastly noise, and instead tell him to be quiet. They have faith that the monster is real, and in the end the boy decides to stop pushing the issue because everyone seems happy to keep believing in the monster. Egan travels to a nearby town to stay with his aunt and her family during the local annual fair. This fair isn't the usual thing, though - it's held in honor of and to celebrate the monster who lives on top of Kneeknock Rise. This is a fabulous story about the difference between fact and truth, about people's willingness to believe even when evidence to the contrary is right before them, and about the strange power of myth. I loved it, of course. Babbitt can weave a special kind of magic into her Egan travels to a nearby town to stay with his aunt and her family during the local annual fair. This fair isn't the usual thing, though - it's held in honor of and to celebrate the monster who lives on top of Kneeknock Rise. I LOVED THIS BOOK. i loved uncle Ott's poems. I think unce Ott was my favorite character because he very wise. He was just so simple. I didn't understand at first, I ended up reading the book twice before really understand the message in this book (there are a few) but the one that really stuck with me is that simple can be rather good. Sometimes things don't have to be exaggerated to make it sound good. Simplicity is a really natural, good thing. This was an odd book. A fable of people believing something, even when the thing they believe in is proven wrong. I think it could have been more enjoyable for me, had I gone into it knowing it wasn't terribly 'brilliant' in its outcome. I'll put it in my classroom library and perhaps my students will enjoy it. "Is it better to be wise if it makes you solemn and practical, or is it better to be foolish so you can go on enjoying tourself?" This is my favorite of all Babbitt's books. Her style of writing here reminds me of Hermann Hesse, sort of mystical and dreamy. Highly recommended! This book is a Newbery Honor Book having been recognized in 1971. It takes place in the autumn and is centered around the annual fair hosted by the town of Instep. Instep lies at the foot of the Mammoth Mountains more specifically below a cliff that is named Kneeknock Rise. The fair celebrates the local legend, a creature called the Megrimum, whose mournful wail can be heard resonating from the misty shrouded top of Kneeknock Rise. According to the legend no one has traveled to the top of the cl This book is a Newbery Honor Book having been recognized in 1971. It takes place in the autumn and is centered around the annual fair hosted by the town of Instep. Instep lies at the foot of the Mammoth Mountains more specifically below a cliff that is named Kneeknock Rise. The fair celebrates the local legend, a creature called the Megrimum, whose mournful wail can be heard resonating from the misty shrouded top of Kneeknock Rise. According to the legend no one has traveled to the top of the cliff to see the creature and return to tell about it. The main character of the story is a boy named Egan who is heading to Instep to experience his first fair. In the book, we also learn that one of Egan’s uncles, Ott has mysteriously disappeared. Finally, the day of the fair arrives! The weather is pleasant, yet, the locals are hoping for rain, since the Megrimum is more active and much louder when it rains, and that is what brings in the tourists, and of course with them the money they spend. Egan enjoys the fair, the rides, the games of chance, the food, and he buys gifts for his family. The rain comes and with it the mournful shriek of the Megrimum! Everyone tries to see the creature but a shroud of mist obscures the mountain top. Egan says he would like to climb to the top and slay the creature! His cousin Ada challenges him to do just that, and before he can think twice; Egan accepts her challenge and makes the climb! I chose this book because it shows how myths emerged from scientific realities which is one thing I love about this story - that it explores the nature of the conflict between science and mystery. It's a great book for 4th or 5th graders and through it we can see how ancients equated natural phenomena to the magical until disproven by science. Egan goes to his Aunt’s and Uncle’s house for a big fair in Instep. His little cousin, Ada, shows him around and tells him about the mystery of the hill Kneeknock Rise. She says a monster lives at the top of the hill and will eat anyone who tries to disturb it. Then the big fair arrives and Egan is full of excitement. He buys all his family members a gift and is having a great time. Once the fair is over, and storms starts to settle in, Ada dares Egan to go up Kneeknock Rise and slay the beast. With no hesitation, Egan begins his climb. With terror, Ada goes back to seek help from the townspeople. After an hour of hiking, Egan makes it to the top. After searching, he comes to realize there is no monster. Once he makes his way back to the little town, he tells everyone. But no one believes him. The next day, as Egan goes home, he thinks who is the wise king and who is the fool? Here are two causes and effects from the book “Kneeknock Rise”. Egan loses his uncle’s dog, Annabelle, at the top of Kneeknock Rise to his Uncle Ott, who too climbed the mountain. The effect was his Uncle Ott was very happy to be reunited with his pet dog. Another cause was that Egan found out there was no monster at the top of the hill. And some effects were, people didn’t believe him, and Egan becomes anonymously famous. Since I read this to take a break from the more adult and depressing novels I have been reading about Slavery, and the Industrialization of the USA, I was not at all disappointed to have a get-away into a "not quite fantasy" work. While Babbitt's Tuck, Everlasting was a journey into fantasy, this shorter work for Intermediate-level readers was just as suspenseful! And, it involves a theme which I always struggle with: When is it not necessary that the facts be known by everyone, and a parallel t Since I read this to take a break from the more adult and depressing novels I have been reading about Slavery, and the Industrialization of the USA, I was not at all disappointed to have a get-away into a "not quite fantasy" work. While Babbitt's Tuck, Everlasting was a journey into fantasy, this shorter work for Intermediate-level readers was just as suspenseful! And, it involves a theme which I always struggle with: When is it not necessary that the facts be known by everyone, and a parallel theme of why people choose to believe in things they know not to be true. There "hero," Egan, discovers the truth about a supposed monster on a rocky hill and tries to impart that knowledge to the townspeople who live below the hill and use the legend of the monster as a tourist attraction. They seem to want none of his knowledge. Should he force it upon them? Summary: This exciting chapter book tells the story of a young boy named Egan who visits his extended family in a town called Instep where just outside the town resides a mysterious phenomena that sits atop a rise. Egan is challenged by his cousin to explore what is on the rise and what he finds is a mystery in itself. Evaluation: I enjoyed reading this book because it had a lot of passages that were a little difficult to read so overall this would be a challenging, yet interesting book for upper Summary: This exciting chapter book tells the story of a young boy named Egan who visits his extended family in a town called Instep where just outside the town resides a mysterious phenomena that sits atop a rise. Egan is challenged by his cousin to explore what is on the rise and what he finds is a mystery in itself. Evaluation: I enjoyed reading this book because it had a lot of passages that were a little difficult to read so overall this would be a challenging, yet interesting book for upper grades. The concept of this book was also a goof fit for developing minds and personalities as it brought up a lot of questions about integrity and finding oneself. This story is about a boy named Egan. He went to visit his aunt Gertrude in Instep for an annual fair. In this little town, there was a mystery that a mournful creature called the Megrimum lives in at the top of Kneeknock Rise. In the fair, Egan's cousin, Ada, laughed at him and his favorite dog, Annabelle that they were sissy. He wanted to prove they were not sissy, so he decided to climb the top of Kneeknock Rise with Annabelle. When he climbed up the top, he saw Uncle Ott. Uncle Ott told him This story is about a boy named Egan. He went to visit his aunt Gertrude in Instep for an annual fair. In this little town, there was a mystery that a mournful creature called the Megrimum lives in at the top of Kneeknock Rise. In the fair, Egan's cousin, Ada, laughed at him and his favorite dog, Annabelle that they were sissy. He wanted to prove they were not sissy, so he decided to climb the top of Kneeknock Rise with Annabelle. When he climbed up the top, he saw Uncle Ott. Uncle Ott told him there isn't any Megrimum, just a spring. Going down the hill, he told others about the fact. Yet, no one believed him. The young boy, Egan arrives in Instep to stay with his aunt and uncle for the annual fair, and he is immediately drawn to Kneeknock Rise, the misty peak that is surrounded by superstition and stories. He even hears the moaning of the monster on the peak, and although it scares him, he is fascinated. And so when his cousin dares him to go to the top of the the rise, he does it, and what he finds at the top would shock the whole town. Just like Tuck Everlasting, this book has a deeper story - are y The young boy, Egan arrives in Instep to stay with his aunt and uncle for the annual fair, and he is immediately drawn to Kneeknock Rise, the misty peak that is surrounded by superstition and stories. He even hears the moaning of the monster on the peak, and although it scares him, he is fascinated. And so when his cousin dares him to go to the top of the the rise, he does it, and what he finds at the top would shock the whole town. This is a fairly short story about a boy named Egan who travels to a town named Instep to go to the local fair. The town is in the shadow of Kneeknock Rise, part of the mountain where a terrible monster named the Megrimum dwells. The villagers will not travel there and live in fear of its wrath. I have only previously read Tuck Everlasting, so my Babbitt exposure is still in its infancy, but this book was delightful. If not a bit slow. The characters were distinct, even if they weren’t all likable *cough*Ada*cough*, and the book’s overall message was very wise-albeit a little too on-the-nose in the current social climate here in the US. The foreshadowing with Orr’s verses was very clever, and the ending was very fitting. This little book is a gem! Read it in one night and was thoroughly entertained. It would make a decent, quick read aloud for grades 3-5. There are some life lessons here, but if I talked about this story and what I think it r ally means, I would give away too much. Worth reading, at any rate. It’s been a long time since I read anything from Natalie Babbitt (Tuck Everlasting is another great story) - maybe I should read something else by her. 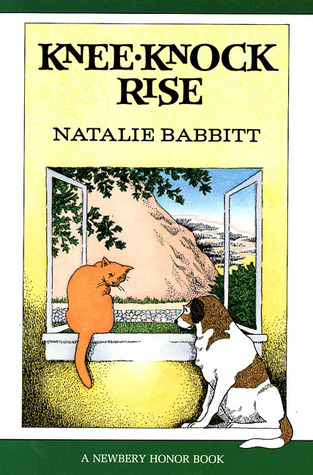 I read the book Kneeknock Rise by: Natalie Babbitt. This book is about a boy that live so far from a village that every year he goes for the festival. When it was the day that he had to go his uncle pick him up and he was going to ride a mule and his uncle on a horse. The boy say that the mule was so slow sometimes and sometimes you could not stop her. In the village all the peoples that live there are scared of the megrimum that is on the top of the kneeknock rise mountain because when it rains I read the book Kneeknock Rise by: Natalie Babbitt. This book is about a boy that live so far from a village that every year he goes for the festival. When it was the day that he had to go his uncle pick him up and he was going to ride a mule and his uncle on a horse. The boy say that the mule was so slow sometimes and sometimes you could not stop her. In the village all the peoples that live there are scared of the megrimum that is on the top of the kneeknock rise mountain because when it rains at night there is a roar and they say is the mergrimum. One day when it was the festival the boy was with her cousin and she say that he was afraid of the mergimum and he say that he wasn't afraid of a itching and he start climbing the kneeknock rise when he got to the top he found his uncle Ott that was lost for so many years an his uncle say that it wasn't any mergimum that the mountain was a volcano. I like everything about this book because it was really interesting. The part that I really like was when the boy found his uncle Ott and when he was climbing the kneeknock rise. I would not change anything about the book because I like the way it is. This is beautifully written. And the struggle with blind belief despite facts is hitting so close to home right now that I found the story to have something of a bitter after-taste. If we weren't fighting for objective truth in our greater society at the moment, if evidence-based science weren't under attack, I would've enjoyed this book even more. Thought I might use this as a companion read-aloud for my class's novel study of Tuck Everlasting. But, I don't think it will work. It will work, however, for sharing beautiful descriptive passages. This book was a read-aloud in our home. It inspired many conversations among the children. This was the first of Natalie Babbitt's writings we have read, and according to many reviews, her other works were enjoyed very much, which inspires our home to read more of her offerings. A village under the spell of a frightening sound holds a festival each year in honor of the monster that they believe makes the sound. Egan travels to the festival and makes the discovery of what truly makes the sound. But the village people refuse to believe him. A story of how people really want something to believe in- or maybe that people will believe what they want no matter the evidence. This story is that much better for Babbit's lyrical writing. I read this book because the author who penned this book also wrote my favorite book: Tuck Everlasting. The book showed promise at the beginning with a good dose of suspense, but sadly did not live up to my hopes for it. Could have done more with the reveal.